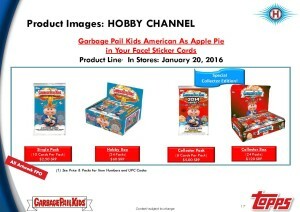 Tops just released information on the new 2016 Garbage Pail Kids American as Apple Pie In Your Face set. Whew that’s one heck of a title. 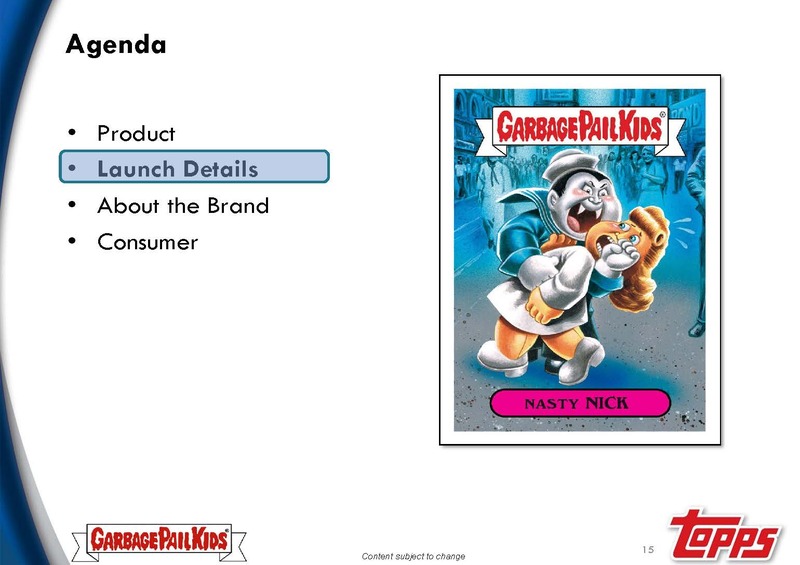 Cardboard Connection was the first to post information about the upcoming series which is set to release 1/20/16. This new set is setup up much like the previous 30th series, but with completely new parallels, and inserts that resemble previous releases. 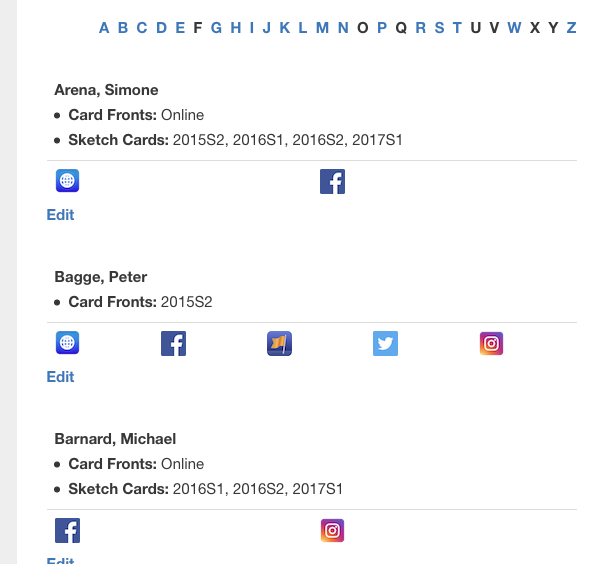 Once again the base set will be made up of subsets just like the 30th set. 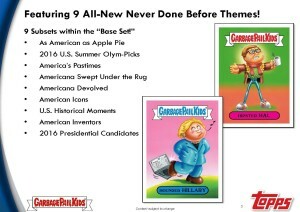 This time there will be 9 subsets that make up the base set; (American as Apple Pie (84), American Swept Under the Rug (18), America’s Pastimes (18), American Icons (18), Americana Devolved (18), American Inventors (18), 2016 Presidential Candidates (10), 2016 US Summer Olym-Picks (18), and US Historical Moments (18)). 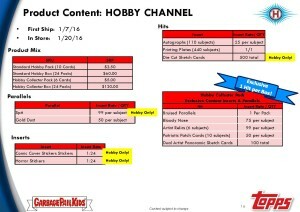 For Hobby/Collector’s boxes Topps is completely changing parallels and their insertion rates. Spit Splatter is limited to 99 copies and only found in Hobby, Bloody Nose is limited to 75 copies and only found in Collector, and Gold Dust is limited to 50 copies and can be found in multiple box types. 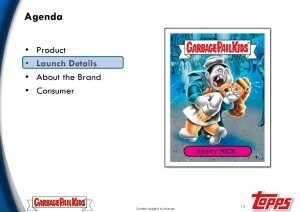 No word yet on what parallels will be found in Retail packs/boxes. 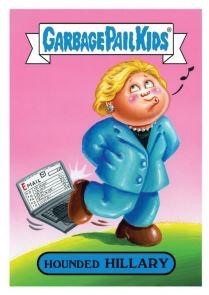 Bonus cards also look to be a thing of the past. 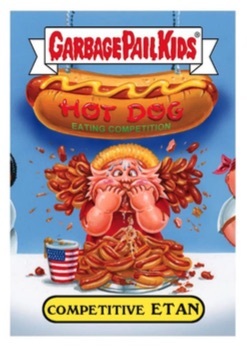 Similar to the 30th set both Hobby and Collector boxes will come with 1 Comic Covers card (I’m guessing this is where those IDW Micro fun pack cards went) and 1 Horror Card. 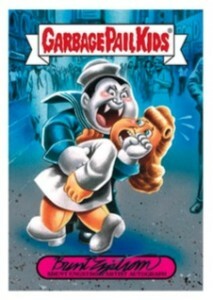 These look to replace bonus cards similar to the Foreign Legion cards in the 30th set. 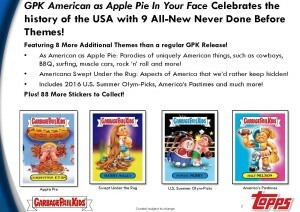 Finally Hobby and Collector boxes have other goodies inside similar to older releases. 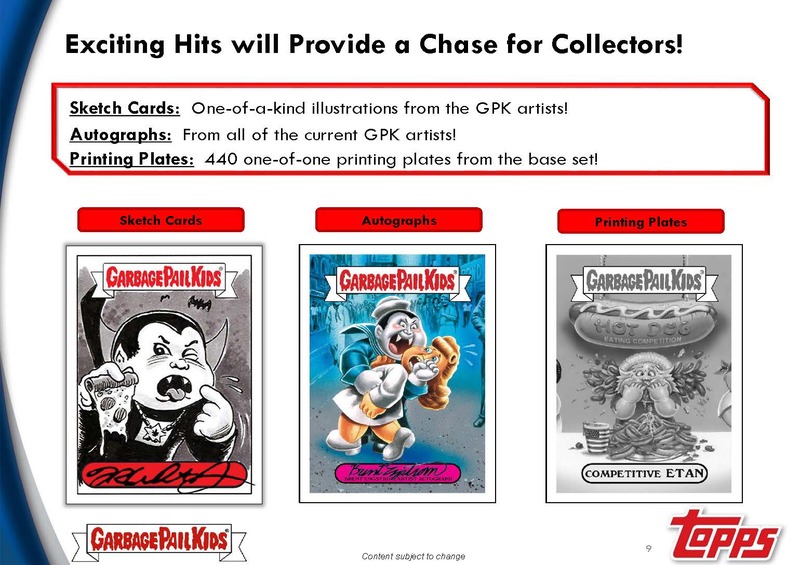 Die-cut sketches, Printing Plates, Patch Cards limited to 50 each, Artist Relics similar to the 30th set, autographs (The example I saw shows a return to base cards being autographed), and panoramic sketch cards look to be moving from Blaster boxes to Collector boxes. 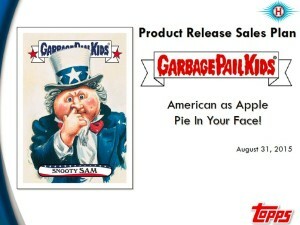 The Collector box guarantee of a auto, plate, sketch, or patch card per box looks to be returning with this release. Some interesting choices from Topps. 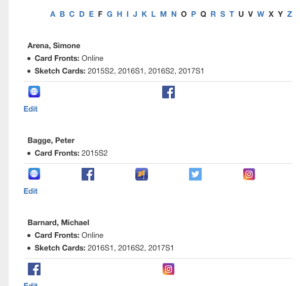 Going with a large base set and using subsets again. 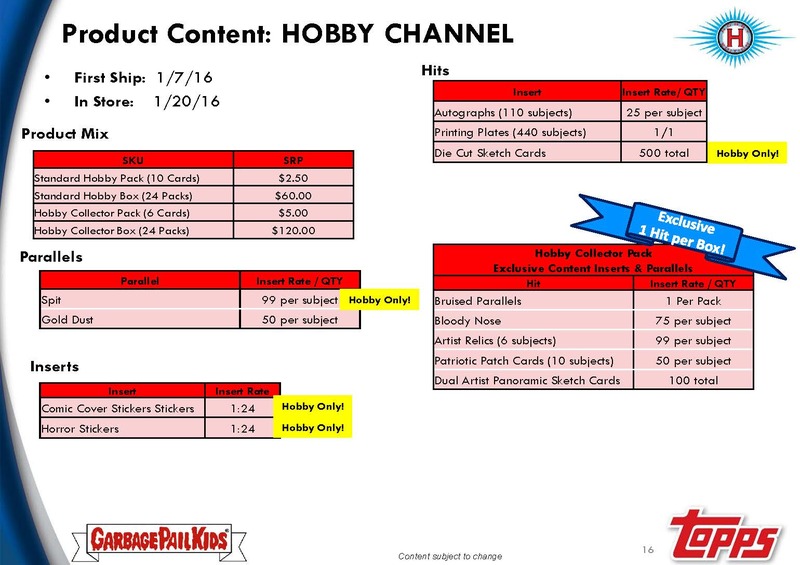 Completely changing how parallels look and are distributed, and removing the extra parallels from Collector’s boxes. Lots to digest here, more info to come once the sell sheet comes out. News today coming from Paul Lesko on Twitter that Topps filed for two trademarks on August 10th for the letters GPK. 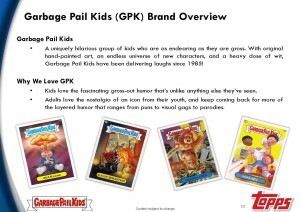 According to Mr. Lesko, Topps never previously trademarked the acronym “GPK”, only the term “Garbage Pail Kids” was trademarked. 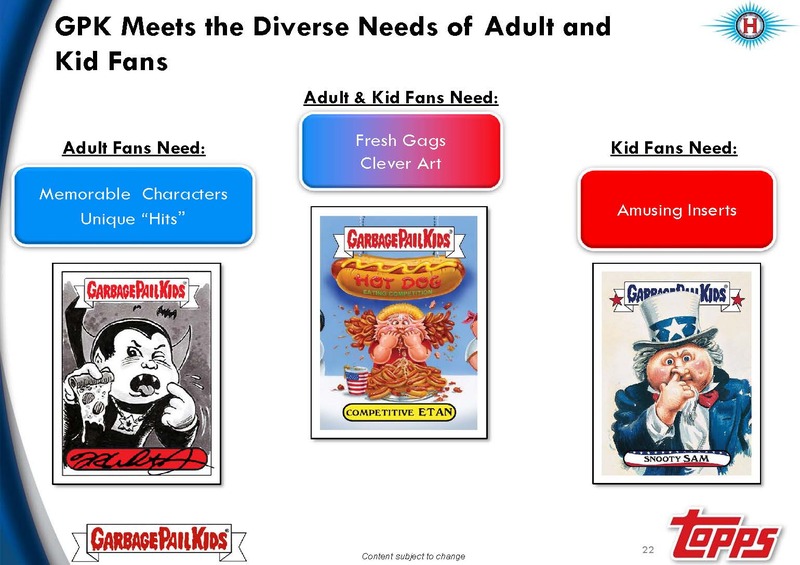 It remains to be seen how Topps will use this trademark going forward. Now that the 30th anniversary set has been released there have been no upcoming announcements for future GPK card sets. This past week was the yearly National Sports Collectors Convention. 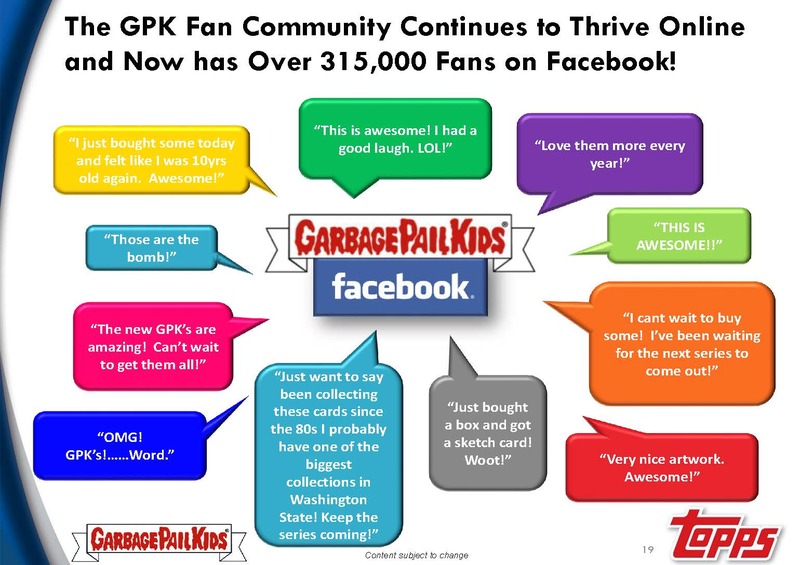 Topps held their yearly Q&A session with collectors on Saturday morning. 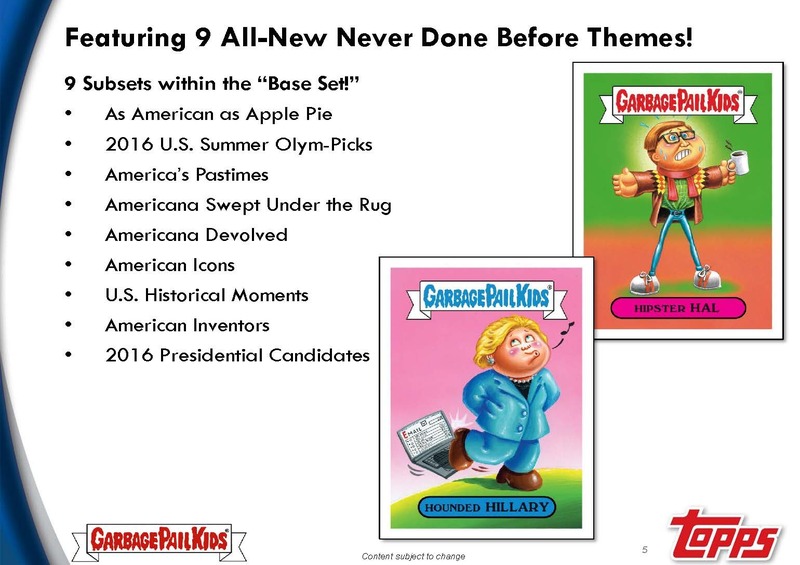 While this convention is 99% sports collectibles related, there can be some tidbits of news coming out that relates to Garbage Pail Kids. During the session one collector asked something that is a common complaint among GPK collectors. 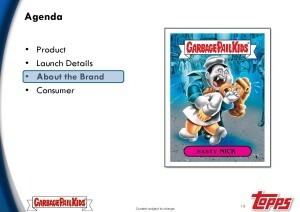 They inquired to Topps if they can do something about pack searchers and the packaging they use. 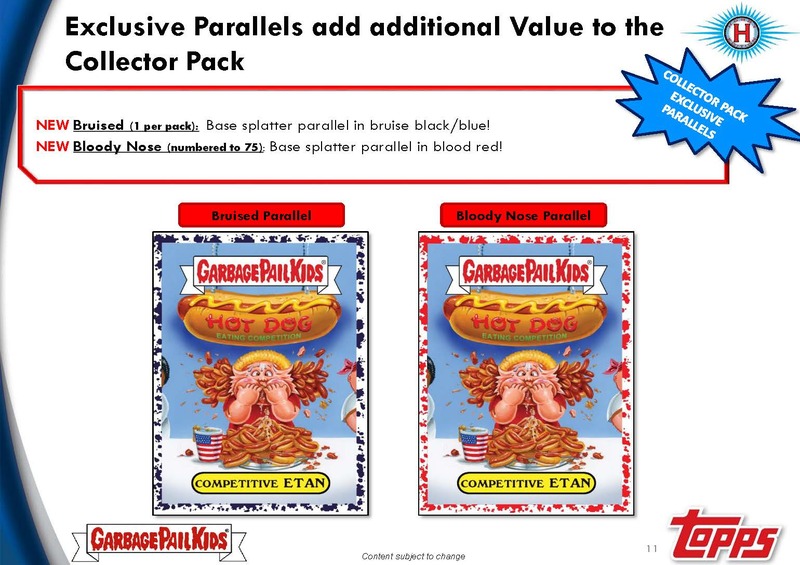 In Topps responce they mentioned both Hanger Blisters and Blaster Boxes as ways Topps has worked to make pack searching harder. They also stated they have spoken to Wal-Mart and Target in working to stop pack searchers. 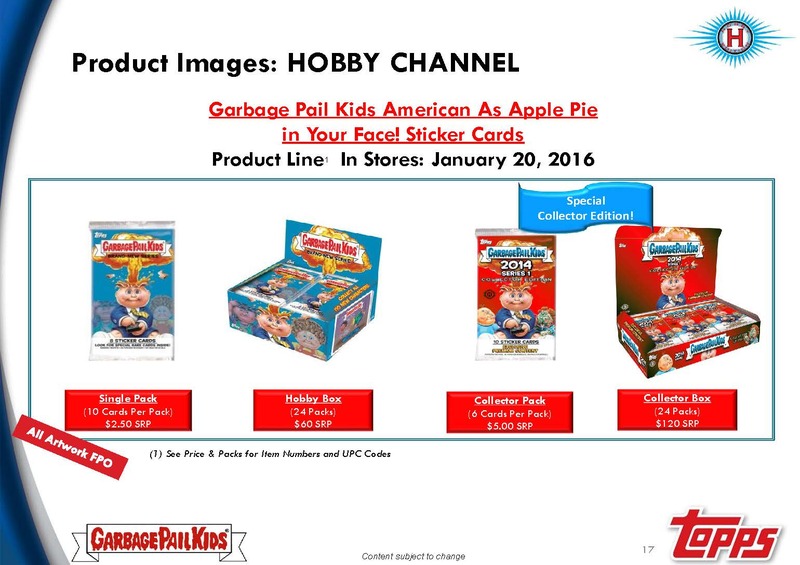 But here’s the interesting part, Topps went on to say they are working on their retail packaging and that next year they will have packaging that is virtually unsearchable. 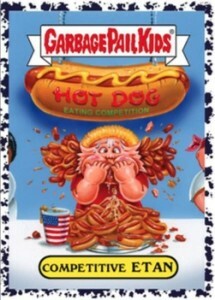 If Topps can pull this off it will be a boon to to retail buying, as many collectors refuse to buy opened gravity feeds or retail boxes because of pack searching. 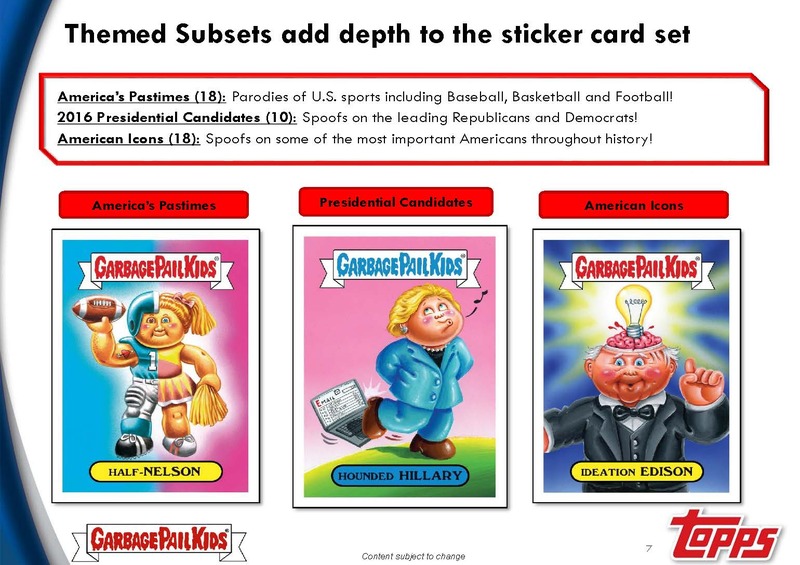 In other news to come out of the session, Topps explained that there are times when not all the stated amount of inserts/parallels will make it into packaging. 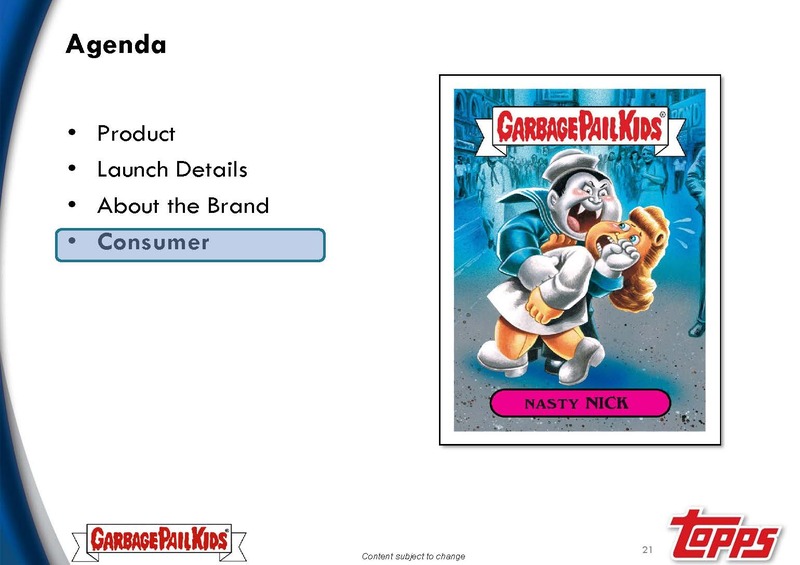 The answer referenced sports products, but could always be applied with GPK. In their example just because a parallel is limited to “299” doesn’t mean 299 get inserted into products. They said they print based on orders, and they always stick to the printed odds. 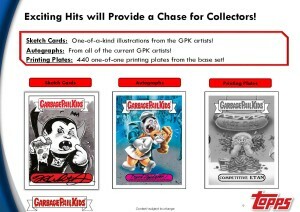 While they never print more, there may be less that what is stated on sell sheets or numbered on cards. 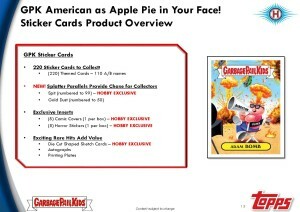 Topps also said they would start breaking card news on their site instead of relying on other websites.